Looking for a mouthwatering dessert that feeds a crowd with ease? Your search is over. Make a pan of Carrot Cake Cheesecake Bars and watch them disappear. Spring is just around the corner and that means that it’s carrot cake season! Although, isn’t it always carrot cake season? Please tell me it isn’t just me. Carrot cake and cheesecake are always a welcome sight around here. 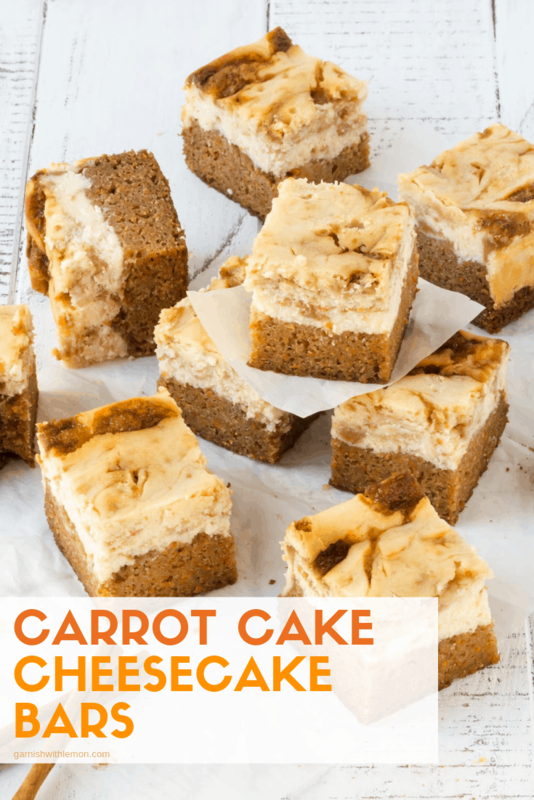 And you are in luck today because I took 2 of my favorite desserts and combined them into one spectacular one and made these Carrot Cake Cheesecake Bars. Traditionally a carrot cake recipe calls for oil to keep it nice and moist, but I used my favorite Kerrygold butter in this version. The high-fat content of this grass-fed goodness makes an amazing carrot cake. It’s the perfect blend of cinnamon, nutmeg, and carrot flavor. Simply add the cheesecake batter, swirl it all together and it’s heaven on a plate. 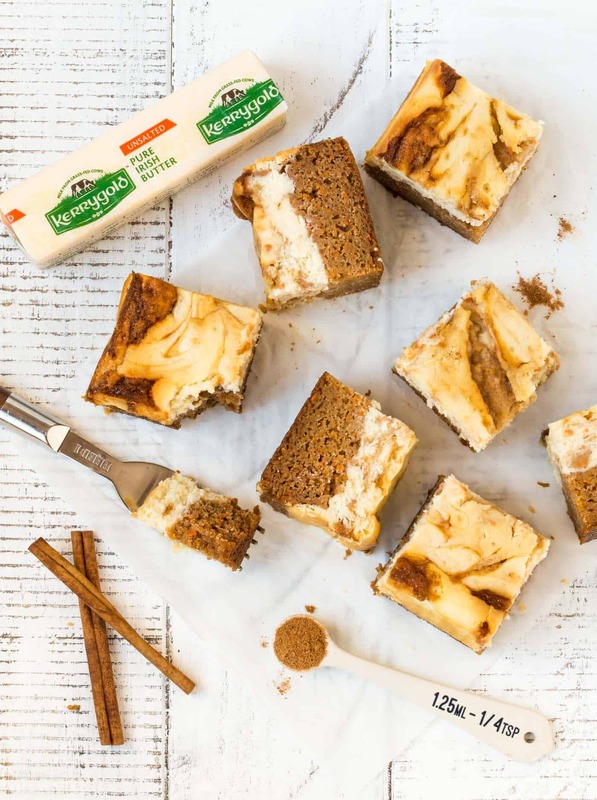 The marble swirl is what makes these Carrot Cake Cheesecake Bars so beautiful, but don’t stress about making your bars look just like the pictures. There is no wrong way to make the marble swirl and no matter how many times you try, that swirl will never look the same. And that’s OK!! Simply alternate spoonfuls of the cheesecake and carrot cake batters in alternating spoonfuls in the pan. Drag a sharp knife through the top in a circular motion to create the swirl. 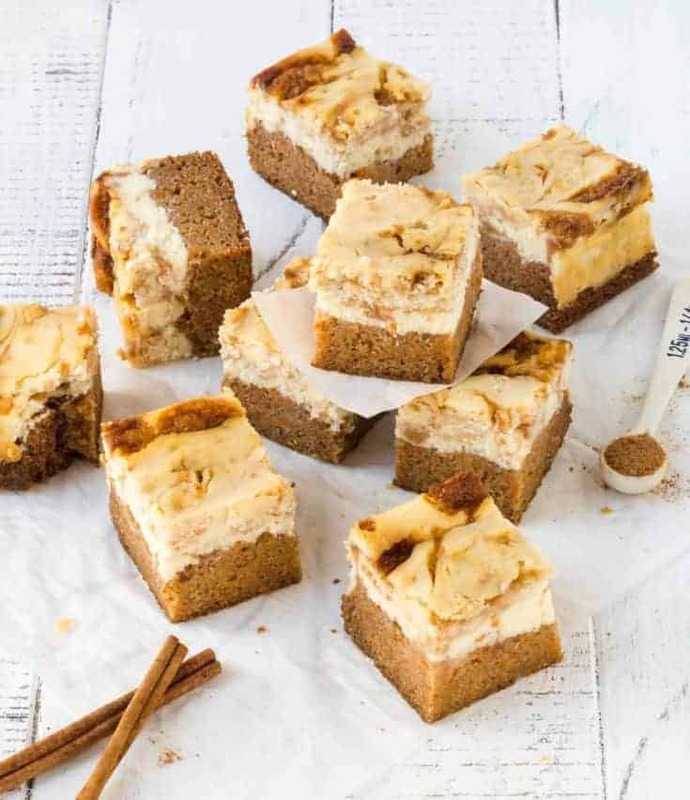 These Carrot Cake Cheesecake Bars make a rich, decadent dessert that looks like you slaved for hours in the kitchen. That gorgeous swirl will do it every time. But don’t worry, your secret is safe with me. No one else needs to know just how easy it is. You’ll know what a hit they are when you look at the clean plates and share the recipe. Preheat oven to 325°F and line an 8 x 8 pan with parchment paper and set aside. Mix 1 cup each of the flour and sugar, cinnamon, baking soda, nutmeg and salt in large bowl. Add melted butter, 2 of the eggs, 2 teaspoons vanilla extract and carrots; mix well. Spread 1/2 of the batter into prepared baking pan. Reserve remaining batter. Set aside. Beat cream cheese and remaining 2/3 cup sugar in another large bowl with an electric mixer until well blended. Add cream, 1 teaspoon of vanilla, remaining 1 tablespoon of flour and beat well until blended. Add remaining 2 eggs, 1 at a time mixing until just blended. Pour half of the batter on top of the carrot cake batter. Drop spoonfuls of the cream cheese mixture and reserved carrot cake batter, alternately, over the cheesecake batter in pan. Cut through several times with knife for marble effect. Bake 50-60 minutes or until a toothpick inserted in center comes out clean. Cool in pan on wire rack. Refrigerate for at least 2 hours or overnight before cutting into squares and serving. You can never have too many recipes for cheesecake bars! What are you waiting for! 🙂 Have fun baking! I can’t wait to try these for Easter! Do you bake in an 8×8 (as noted at beginning ‘preheat & parchment line…’ or 9×13 (as notes ‘spread half the batter in a greased & floured…’? I am assuming the remaining vanilla extract goes in the cheesecake mixture, yes? Yes! I just updated the recipe. Thanks for catching that!